Is it just us or when the mornings get darker later does it seem like breakfast is more rushed? Start your day right with organic sunflower butter smoothies that will give you energy quickly and easily. If you are looking for peanut butter alternatives for allergy reasons or personal preference, organic sunflower butter is a great substitute since it has a similar consistency and more nutritional value. Smoothies are a great way to get a lot of nutrition when time is of the essence – breakfast, lunch, or snacks. They’re quick, great to take on the go, and easily adapted to personal taste. The first recipe we found over at Curly Girl Kitchen. Heather lists several of her favorite smoothie recipes, but this one from her blog about fruit and nut butter smoothies really stood out. We’re posting the ingredients here so you don’t have to search around and can visit her blog if you like. The next one is a velvety pink concoction we found over at Coffee & Quinoa that is as tasty as it is pretty! We love Erica’s enthusiasm for healthy eating as much as her way with words. She combines raspberries, beets, and sunbutter with other delicious and healthy ingredients that, as she hilariously points out, got the approval of her man. Now you know this is a winner! Pop over to her blog to get the recipe for her Shocking pink sunbutter smoothie. Do you have some organic sunflower butter smoothie inspiration to share with us? We’d love to hear from you! Searching for peanut butter alternatives? Ours are made in small batches from the finest ingredients (no GMOs!). 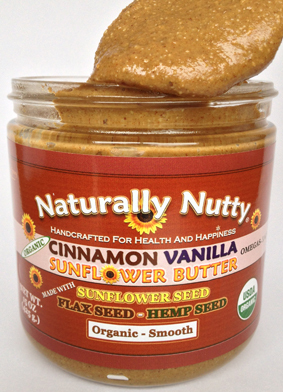 Come and visit us online at Naturally Nutty for organic sunflower butter, organic almond butter, and more!